Humanitarian action for natural hazards is evolving, learning from catastrophic events such as the 2011 Horn of Africa famine, and the Mozambique floods of 2000. While the full extent of the impact of Cyclone Idai is still unknown, we do know that even with the airport closed and roads impassable, the Mozambique Red Cross were already on the ground in Beira having been preparing communities by disseminating early warning messages and prepositioning non-food items such as emergency shelter kits, blankets, and mosquito nets. The preparedness activities led by the Mozambique Red Cross were facilitated by an innovative humanitarian system known as ‘Forecast-based Action’, whereby early action plans are triggered when a specific forecast of a natural hazard is made. These early action plans are supported by evidence from academics, with research contributing to early pilot projects in Uganda and Peru, and ongoing research under NERC / DfID’s SHEAR programme providing the tools and evidence to support the scale-up from these initial pilot projects to systematic international financing mechanisms for approving and funding early action on the basis of a forecast. As part of the Forecasts for Anticipatory Humanitarian Action (FATHUM) project, my team of researchers has been supporting the Mozambique Red Cross and German Red Cross in the development of early action protocols for preparing for tropical cyclones. This work has addressed the relationship between tropical cyclone magnitude and associated impacts in the country, and has prompted discussions about the most appropriate actions to take to reduce the risk. For example, while installation of temporary roofing is a valuable early action for heavy rainfall caused by El Nino events in northern Peru, this is inappropriate during tropical cyclones where strong winds and poorly-secured roofing create an additional hazard. 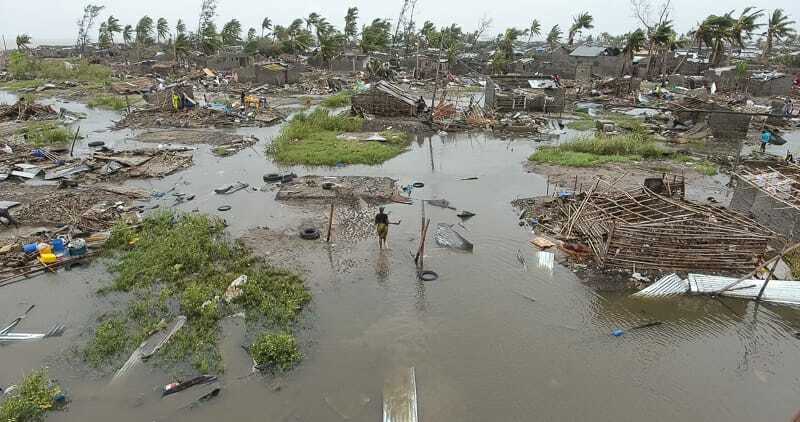 On March 14th 2019, a day before Idai hit the coast of Mozambique, 340,000 swiss francs were released from the IFRC’s Disaster Relief Emergency Fund to directly assist 7500 people believed to be at risk. At this point it was estimated that just over 100,000 people would be affected by this storm, but even with the full extent of the disaster yet to emerge we can already see that this number is now much higher, with reports that at least 400,000 people have been made homeless in Mozambique alone, with many more affected in Zimbabwe and Malawi. As with any innovation there is always room for improvement. Our research in understanding tropical cyclone impacts in Mozambique has been hampered by the lack of comprehensive historical data of rainfall, winds, and storm surge impacts as well as vulnerability data that you might expect to find for countries affected by Atlantic hurricanes, for example. But in addition to that, more research and development is clearly needed to create more impact-relevant forecasts to support decision-making. For example, while the wind strength of the storm as it made landfall on the 15th was forecasted well as far ahead as March 10th, uncertainty over the magnitude and location of both the storm surge and heaviest rainfall makes the impactful flooding much harder to predict. Put another way, while we were sure that Cyclone Idai would make contact with Mozambique as a “very dangerous system” many days ahead, the Global Flood Awareness System hovered around a 20% chance of severe flooding on the Buzi River, only giving certainty once the storm had made landfall. 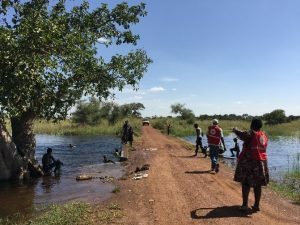 We now know that flooding has hit 5000 people in the Buzi District alone (personal communication with the Mozambique Red Cross). Over the coming days and weeks, we will see better information emerge about the impacts of the storm, and unfortunately we are also likely to hear about the secondary impacts, such as outbreaks of disease, which happen after news crews have left the region. Acting on early warnings is one part of the picture when it comes to building resilience to weather extremes, and Forecast-based Action is just one cog in the humanitarian financing machinery. Successfully avoiding impacts on this scale requires linking together long-term disaster reduction with better early action and faster response, by both supporting local capacity and mobilising the international community when the local capacity is overwhelmed. Behind the scenes the humanitarian community will be working hard to identify lessons learned and improve plans and processes. Researchers from across the interdisciplinary FATHUM project will be using this storm as an opportunity to better understand the skill of flood forecasts during tropical cyclones, to improve our understanding of the complexity of impacts driven by both wind and rain, and to better identify appropriate early actions. One thing already emerging is the suggestion of using this Forecast-based Action mechanism to establish emergency communication systems before a disaster; something that would no doubt improve the humanitarian response by enabling earlier assessment of impacts. Should seasonal rainfall forecasts be used for flood preparedness? In order to get the most time for early warning early action (e.g. for Forecast-based Financing projects), we are particularly interested in seasonal rainfall forecasts, which are issued before a rainy season starts and can give an indication of whether the next three months are likely to be unusually wet or dry. However, in our guidance materials for the use of seasonal forecasts, we clearly mention that these are not flood forecasts (see IFRC maproom), because they are only forecasting total rainfall over a three-month period. The rain could come all at once, or it could be nicely spread out over the three months. In 2008 in West Africa, we successfully used a seasonal rainfall forecast to prepare for flooding, and Red Cross teams were grateful to have taken action before widespread regional flooding happened that year. Therefore, we decided to analyze whether there is a clear link between total seasonal rainfall and flooding – maybe these seasonal forecasts can be a good indicator for flood preparedness. In our recent paper, we use the Global Flood Awareness System hydrological model to compare the total seasonal rainfall that went into the model with the “floodiness” that came out of it. We analyzed all the modeled rivers in sub-Saharan Africa above a certain size, therefore we did not consider flash flooding. Our results showed that in many places, the association between total seasonal rainfall and floodiness is not very strong. Especially in wetter regions of West and Central Africa, it seems that more total rainfall in a season only marginally increases the chances of flooding that season. In East Africa and Southern Africa, the relationship was slightly stronger. forecasts can usually only give slight increases in the likelihood of “above normal” rainfall, this means that in reality there is even lower certainty over where it will flood. so in practice, current seasonal rainfall forecasts are unlikely to ever provide high enough confidence in whether there will be flooding for disaster managers to be comfortable taking flood preparedness actions. future work may change that though! Some scientists are working to get more useable information on flood likelihood during El Nino / La Nina events, and based on the current temperature anomalies in the Indian Ocean. Others have been developing seasonal hydrological forecasting systems. Make seasonal total rainfall forecasts for river basins, in addition to the current gridbox forecasts. Develop skillful seasonal forecasts of the upper extremes of total rainfall (e.g. top 10th percentile) would already be more useful than terciles for anticipating floods. 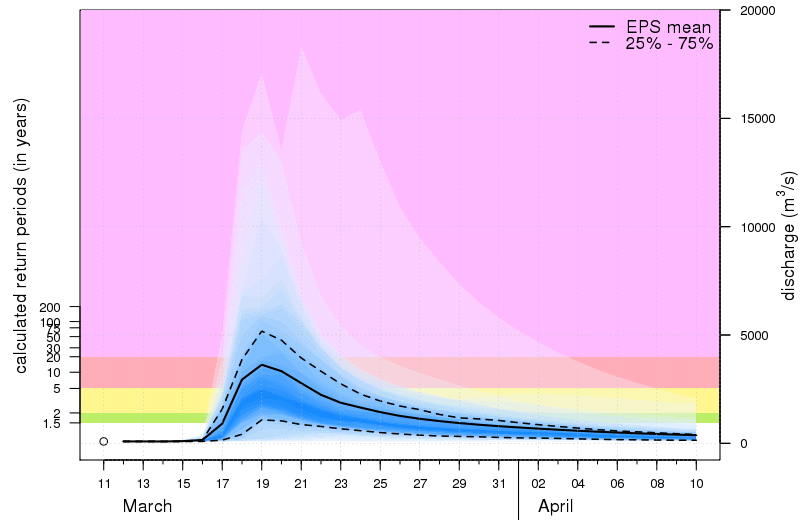 Forecast the number of 3-day extreme rainfall events and seasonal rainfall intensity is more informative for flood preparedness than total rainfall. Invest further into seasonal hydrological forecasts, in which seasonal rainfall forecasts are passed through a hydrological model to forecast seasonal flooding, would also be a very useful step forward (see the freely available new GloFAS model for this). 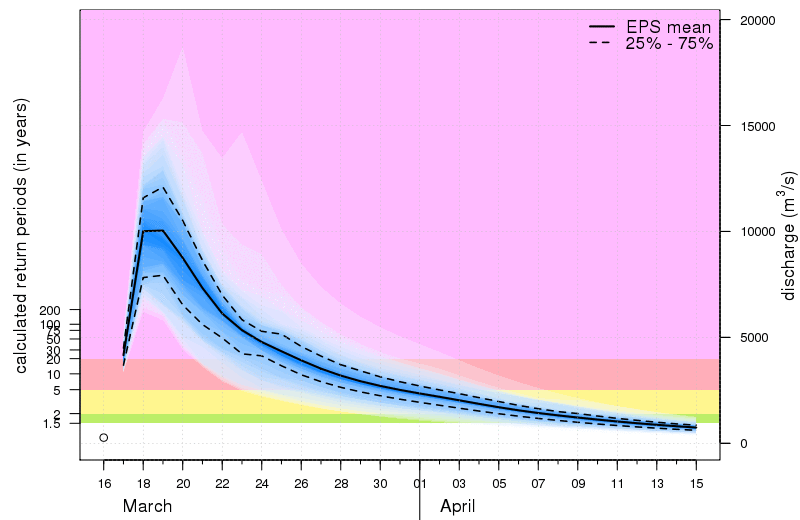 Coughlan de Perez, E., Stephens, E., Bischiniotis, K., van Aalst, M., van den Hurk, B., Mason, S., Nissan, H., and Pappenberger, F.: Should seasonal rainfall forecasts be used for flood preparedness?, Hydrol. Earth Syst. Sci., 21, 4517-4524, https://doi.org/10.5194/hess-21-4517-2017, 2017. Liz joined the first meeting of the SHEAR Studentship Cohort at Imperial College London on April 26th. There are some interesting PhD projects that are now underway that will be working on FATHUM-related topics, for example flood forecasting in Kenya, citizen science for early warning systems and visualisation of forecasts. There will be a SHEAR studentship conference in September which Early Career Scientists from across the 4 main SHEAR consortia will be invited. Liz has also collated all of the abstracts for the Adaptation Futures session on Forecast-based Financing and sent them all to the organising committee. The session will last 1hr45 minutes. There will be a short (5 minute) introduction to FbF for those in the audience who are not familiar in it. Then the rest of the session will be split into two. The first half will showcase FbF case studies, the second half FbF thematic topics. There are 5/6 abstracts in each section, and so there will be 5/6 groups rotating around the room. You will therefore have 8 minutes with each group. I would suggest preparing a flexible presentation – be prepared to speak for up to 8 minutes if there are no questions, but ideally audience members will interject or ask questions and direct the flow of conversation. That way the audience members become an active part of your presentation and research, rather than it being a passive listening exercise. Project management activities this month have also included arrangements for the meeting in South Africa in June. Joy’s efforts have been indispensable, thanks Joy! Andrea has been focusing on the changes of seasonality of flooding in Sub-Saharan Africa with ENSO and Indian Ocean Dipole. He has calculated some circular statistics based on the streamflow reanalysis data-set (GloFAS driven by Era-Interim/Land), in order to identify the flood timing for different ENSO/IOD conditions. These statistics have been mapped over Africa and show significant changes of seasonality in some regions of Eastern and Southern Africa. Participants: Erin Coughlan de Perez, Arlindo Meque, Liz Stephens, and Andrea Ficchì, from FATHUM (WP1); Martin Todd, Dave MacLeod, Maurine Ambani, Mary Kilavi and Augustine Kiptum from ForPAC. The need for an uncertainty assessment of the reliability of forecasts of flooding with ENSO/IOD. The interest of deeper investigations on particular case studies, such as the Shabelle River (Somalia). The results of flood likelihood changes with ENSO/IOD for this river are relevant for decision-making. Results, so far, highlight some distinct predictions for the region, contrasting some current Early-Action policies for El-Niño preparedness. EGU presentation (11 April): Liz presented Andrea’s work at the European Geophysical Union conference, including recent results on the reliability of the statistical forecasts of flooding likelihood based on ENSO/IOD teleconnections. This part highlighted some interesting differences between the reliability of predictions based on either ENSO or IOD. The feedback from the talk was good, in particular there were requests to do the same analysis for drought hazard. They are continuing with their desktop review, including a review of past flood events in Teso (from 2007) and review of sociodemographic info for Amuria and Katakwi districts. They are trying to set up an interview with their disaster risk contact person at OPM. Busy mostly with admin and logistics for the upcoming June meeting. 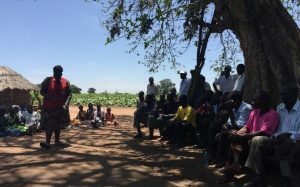 Setting up and conducting interviews with key stakeholders in our field site – this process also critical for finalising the fieldtrip plan for June, and selecting at-risk communities (in the towns and farming communities) for household-level interviews. Ongoing desktop review of past flood events in the Langeberg and collecting reports/historical info on the case study area. Desktop review: DRM/EWS legislation (initiated). Currently Sara is transcribing the recordings from both Dialogue Platforms (Berlin, October 2017 & Nairobi, March 2018), analysing interviews and refining the interview protocol. This preliminary research data forms the basis for the observational analysis document that Sara is currently also drafting. In order to analyse the conferences and interviews, Sara is developing a coding system that enables her to distil dominant themes and understand plural perceptions. 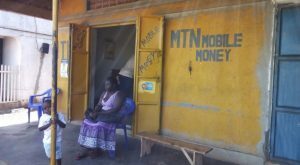 Furthermore, Sara has been reading and summarizing international reports and reviews of existing early action/ and cash transfer projects and literature on the use of probabilistic forecasts in decision-making. Sara is also actively approaching potential interviewees to follow up on some of the talks that I had during the Dialogue Platform in Nairobi. In particular Sara is keen to interview more people on the periphery of the FbF community, please let her know any suggestions you might have. Tobias is due to begin at Reading University at the beginning of June, and will be attending the meeting in South Africa. Question on progress: does anybody have any comments or questions about the progress updates? Does everyone understand the format and what they need to prepare for the Adaptation Futures FbF session? Question on June meeting: what needs to be discussed in Stellenbosch in June? Joy comments: I think that the first half of the first day should be work package presentations and updates on their progress – so everyone knows what everyone else is doing. The morning of Day 2 should involve each work package breaking into separate groups to plan/discuss their work and plans for the upcoming months (while we are fresh and full of ideas!). Those are two ‘sessions’ that I think are critical. Open question: What are the challenges of setting up FbF for transboundary rivers? Thanks to everyone who joined our monthly progress call, the minutes are below. Please add your thoughts on the discussion point in the comments section at the bottom of this post. 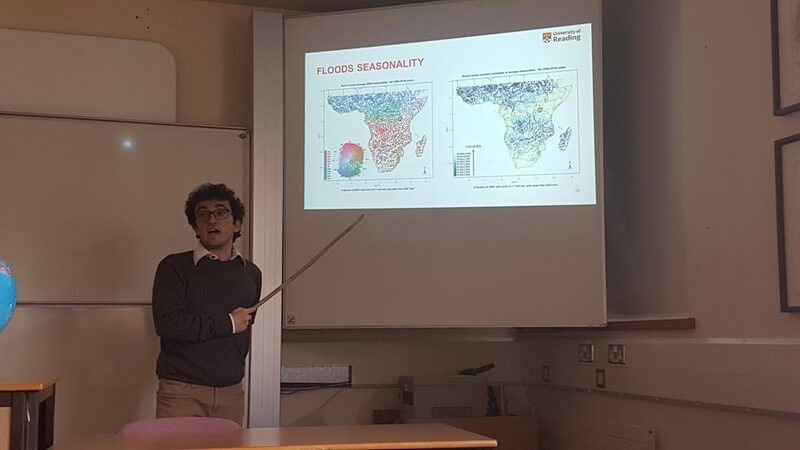 Andrea has been continuing his work on the influence of ENSO / Indian Ocean Dipole on flood likelihood in sub-saharan Africa. He made a presentation to the Tropical Research Group in the Department of Meteorology at Reading and gained some valuable feedback. Liz will be presenting this work for Andrea at the European Geophysical Conference in Vienna next week. Arlindo Meque, based in Mozambique, has been researching tropical cyclone impacts and the precipitation and wind thresholds which lead to different impacts. Joy is in the process of finalising the research tools which have been co-produced among all the case study teams, final versions will be shared soon. From this the teams will be working on desktop reviews and begin the fieldwork. 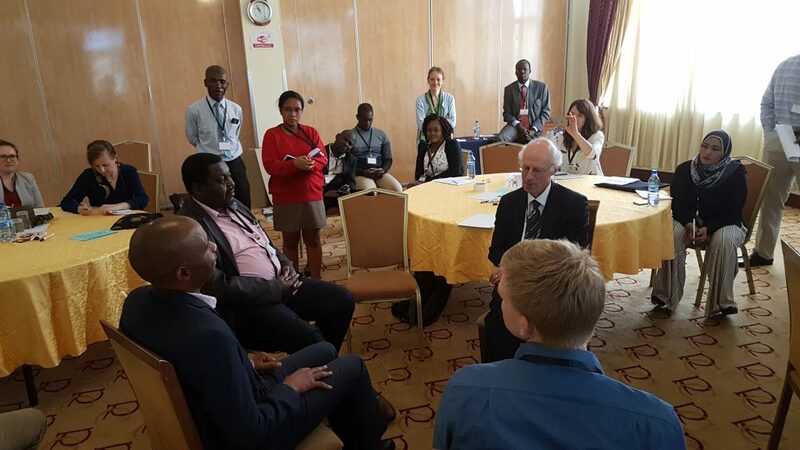 The WP2 team had the opportunity to meet up at the Dialogue Platform in Nairobi. Joy is currently working on a paper on the methodological approach used in FATHUM. Sara has been refining the interview protocol and will be preparing a report based on her initial observations, identifying key themes and looking at factors that inhibit / enable the use of uncertain forecasts. This work is about to start with Toby joining the University of Reading in June. Toby has been working with the Start Network on FbF-related research. Toby introduced himself to the team. All of the WP4 team will be in Stellenbosch / Cape Town in June. We welcome Arielle Tozier de la Poterie and Anne-Catherine Vanhove as collaborators with the FATHUM team. They are working on research related to FbF in Mozambique. A new DREF mechanism for early action will be launched in May in Geneva. Following the Africa FbF Dialogue Platform in Nairobi there will be similar Dialogue Platforms in Latin America and Asia in the coming months where FATHUM work will be featured. FATHUM work will also be presented by the Climate Centre team at the Understanding Risk conference in Mexico City in May. I’m keen for a shift from email to shared comments on the blog posts (obviously where appropriate). Next month’s progress reporting will be done via the blog before the Skype call, giving more time for discussion during the call. I also welcome contributions to the blog, however short, even just a photo of your activities! Anything on the blog will be syndicated via Twitter (to our external audience) and via Slack (to our compatriots in other SHEAR projects). There is a FATHUM shared OneDrive folder that hasn’t been well used, please upload relevant reports, publications, photos etc. I have a final deadline for all information related to the Adaptation Futures session of April 20th. Please could everyone register for the conference by end of the day on Monday. Reading will pick up the invoice for registration fees for those of you under a subcontract if registration has been carried out by then. Joy has been managing accommodation and shuttle bookings for South Africa, please let Joy know if you think you are missing from these arrangements. What presentations / discussions / activities do you want to see at the annual meeting in Stellenbosch? Many members of the FATHUM team came together for the Africa Forecast-based Financing Dialogue Platform in Nairobi to hear the latest on FbF and related topics across Africa. The German Red Cross will no doubt be writing a full report of the session, but here is some ‘I like I wish I wonder’ feedback from the FATHUM team. To everyone who has provided me with updates for the Researchfish reporting. This has now been submitted. To Joy for taking on the significant task of managing the hotel and flight bookings for the Nairobi meeting next week, and our project meeting in June. We have now made an offer to a candidate for the Work Package 4 post doc position. I believe that they will start in June so you will all have the opportunity to meet them at the project meeting. We have two new PhD students at Reading who are working on SHEAR-related topics. Siobhan Dolan is looking at forecasting landslides, and Sazzad Hossain on forecasting floods in Bangladesh (he has already been linking with the FbF project there as part of his role at the Bangladesh Flood Forecasting and Warning Centre). The SHEAR knowledge brokers have set up a ‘SLACK’ account to help with collaborative working. This is an online platform where you can join discussion groups on a number of topics. Please anticipate an invitation to this at some point soon. I would expect at least all of the early-career researchers to join up. Following on from Beauty Shamboko attending the FATHUM Kick-off meeting in July 2017, we are now helping Zambia WARMA to use the Global Flood Awareness System for their monthly hydrological outlooks. To improve collaboration across the Work Packages I will be leading monthly progress calls at 2pm UK time on the first Thursday of every month, beginning Thursday April 5th. At least one person from each organisation should join the call. During these calls everyone will have an opportunity to report on their activities over the previous month, and their key plans for the next month. Please could you add a short comment to this post to confirm you have read it! A range of large scale social protection and risk finance initiatives as well as promising innovations in forecast-based action (FbA) have emerged in recent years. This field of forecast-based early action is rapidly expanding, and consolidating the evidence, experience, and lessons from early efforts to develop forecast-based action and finance tools can help improve the impacts and effectiveness of future investments. The Scoping and Design for Taking Forecast-Based Early Action to Scale project funded under the WISER programme will do just that. ODI and partners including the University of Sussex, the START Network, the Red Cross Red Crescent Climate Centre, and Tetra Tech, will work together to review and share existing forecasting and decision-making capabilities and links to finance for early action that can be triggered in a range of different contexts. The project team will identify opportunities for institutionalising early action through modifications to existing delivery systems, carefully designed in partnership with relevant stakeholders. Three focal studies will be selected to reflect a variety of early action financing and delivery mechanisms. The goal of the focal studies will be to (a) uncover the political economy and other factors influencing the formalisation of FbA mechanisms; and (b) build interest and dialogue between key stakeholders (providers of forecasts and potential users of that information). Research will cover up to three types of ‘systems’: an international financing mechanism; a national delivery system (in a stable institutional context); and through non-state actors (in a fragile context). The completed Focal Studies report will set out the context and rationale for scaling up in each system and describe the process of co-production used to bring together the necessary stakeholders to develop a sound concept. As part of the fieldtrip, we visited the villages of Apeduru (in Amuria County, Asamuk Sub-County, Ajaki Parish) and Okoboi (in Kapelebyong County, Kapelebyong Sub-County, Okoboi Parish). 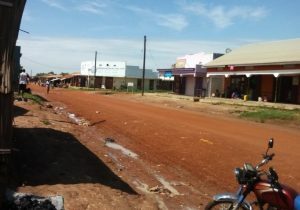 Both of these villages are located in the Amuria District, Teso Sub-Region, 330km and 370km northeast from the country capital of Kampala, respectively. These rural village communities are extremely remote and lack basic infrastructure such as tarred roads, electricity, stormwater and water services. 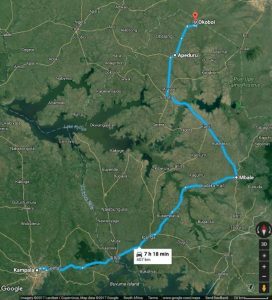 The town of Soroti, where we stayed for the duration of the fieldtrip, is 42km from Apeduru village, and the closest town for many essential services. Although there is fairly good cellphone coverage, many people living in these areas do not possess cellphones. Flooding, drought and diseases were identified as the most prevalent hazards in the two areas visited, as well as many surrounding areas. 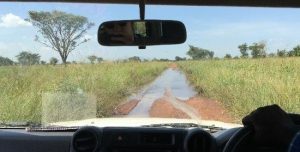 Contributing factors include rain that flows from the higher lying areas to the north such as Kabong, Moroto, Kotido and Nakapiripit districts in the Karamoja sub-region, and even Kenya, to low-lying, flat, swampy areas. Furthermore, it was indicated that soils in the area have a low water permeability and therefore maintains a high water table. The photos below show the main road to Apeduru and the high water level from heavy rainfall in Okoboi parish, which fell 2-3 days before the fieldtrip and caused severe waterlogging. The following impacts from the waterlogging were reported: 781 gardens and 7 houses were destroyed, and 24 households were relocated to higher ground. During heavy rainfall periods such as the one experienced prior to this fieldtrip, communities in these areas are often at risk of being cut off, with no access to main towns, neighbouring villages, nor incoming relief. During group discussions with residents from Apeduru and Okoboi villages, residents indicated that the Uganda Red Cross has provided significant assistance during floods, such as flood-resistant housing. Furthermore, through environmental education and awareness, such as discussion on the most suitable crops and planting seasons, the Uganda Red Cross has built capacity and increased people’s preparedness to disaster risk. Unfortunately, due to standing water and damp conditions caused by flooding, diseases such as malaria, pneumonia, and foot-and-mouth are still prevalent in these areas. Waterlogging is also a major hazard that impacts negatively on local farming and agriculture. 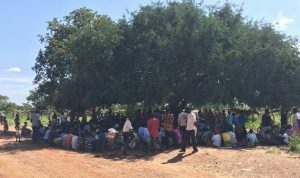 Residents from Okoboi village indicated that gender inequality in still prevalent, with men and women having specific roles and there being no gender cooperation; women, for example, are often excluded from critical decision-making processes. During the group discussions, the communities highlighted a number of needs during this waterlogging event: tarpaulins for drying crops since their compounds are waterlogged; water purifiers for water treatment; mosquito nets and mosquito residual spraying; adequate water points since current water points are shared between people and their cattle; access to seed of fast-maturing crops; and gumboots and saucepans. 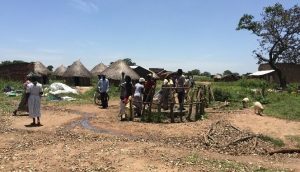 The photo below shows water collection at a communal borehole, which is often shared with neighbouring villages and causes conflict during the dry season. During the group discussions, the two communities noted that prior to Red Cross intervention, they had their own indigenous knowledge for coping with water logging. The interventions they carried out included erecting bed stands in cases of flooding, and using iron sheets as flood covers. Since the intervention of FbF, they now have access to safer shelter and have learned how to dig trenches before flooding. These communities also attributed the reduction of malaria cases and waterborne diseases to the FbF intervention. The Red Cross also carried out other interventions in these areas, including environmental conservation, adopting and using energy-saving stoves, and provisions of soap, jerry cans, water tables, and garden hand-hoes. We want to thank the Red Cross officials, and the local communities and their leaders for giving us their time and for their willingness to discuss some of the issues that they face during flood events. An interesting comment piece from Madhab Uprety, Disaster Risk Reduction consultant, and Sumit Dugar, Research Associate at Practical Action Consulting South Asia on the recent floods in Nepal has been posted here. It is largely unclear among the humanitarian actors and government stakeholders about what levels of forecast probabilities and magnitude are worthy to react. Practical Action together with support from the World Food Program have been advocating this approach in Nepal and the idea has already been put-forth across national Disaster Risk Reduction (DRR) platforms for discussion. FbF is currently being piloted in six flood prone districts of West Nepal and there is an intention to upscale these initiatives across entire southern flood plains of Nepal. Forecast thresholds and triggers have been identified and Standard Operating Procedures (SoPs) that includes science informed anticipatory actions have been developed and integrated in the local disaster preparedness plans. Sumit Dugar is part of the project team of the SHEAR LANDSLIDE-EVO project, and is keen to connect with the FATHUM team. We will shortly be advertising a PhD project to work alongside the FATHUM team, focussed on supporting Forecast-based Financing in Nepal. The student would link with Practical Action Nepal and the Nepal Department of Hydrology and Meteorology. The FATHUM team in South Africa has selected the Langeberg Municipality in the Western Cape as the case study site for this research. South Africa’s Western Cape, which is home to over five million people, is known as “the Cape of Storms.” Due to the Langeberg Municipality’s extensive disaster history, steep topography, and remoteness of its rural communities, it was identified as a hotspot for high-impact weather events that increase the likelihood of destructive flash flooding. 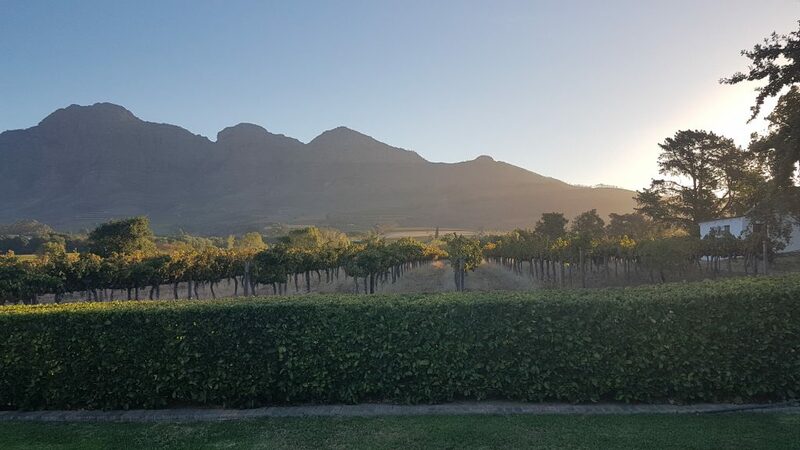 The Langeberg Municipality, which is one of five local municipalities within the Cape Winelands District of the Western Cape, is located about 180 km east of Cape Town. 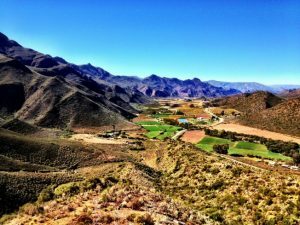 The Langeberg Municipality has a population of 98,000 involved in a diverse economic base that includes mainly agriculture, forestry, and fisheries (15.3% of GDP, 23.1% of workforce in 2014), tourism, and manufacturing (17.5% of GDP in 2015). 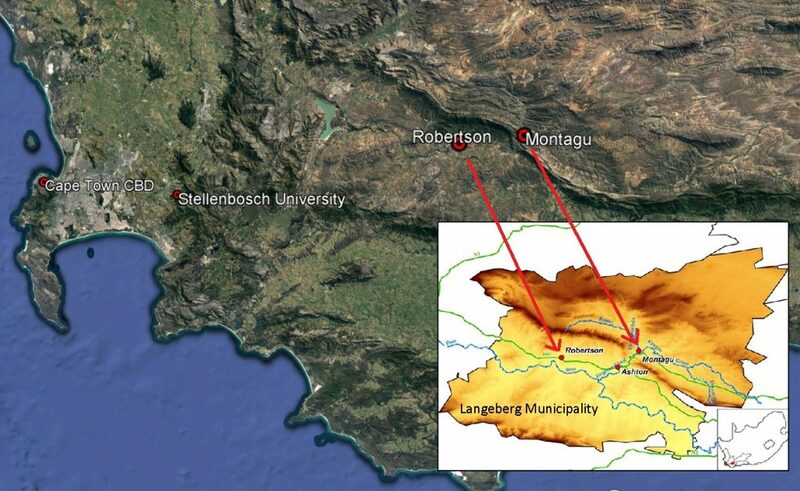 The Langeberg’s major towns (Montagu, Robertson, Ashton, and Bonnievale) are surrounded by complex mountain topography. The steep gradient of these mountains and the elongated and lobed shapes of the catchments in this area increase the likelihood of flooding, particularly flash flooding. From 2003 to 2014, the Langeberg Municipality experienced six disasters associated with severe weather events caused by cut-off low pressure weather systems. 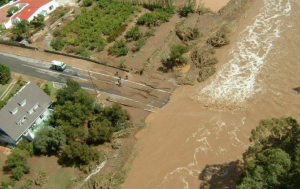 The resulting disasters were characterised by widespread flooding, with impacts reported across the Western Cape. During that time, the Langeberg reported total financial losses of around ZAR 23.6 million, with 6,424 people affected or requiring assistance. 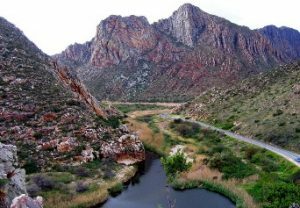 The town of Montagu, with its population of 15,176, is situated at the confluence of two major rivers. 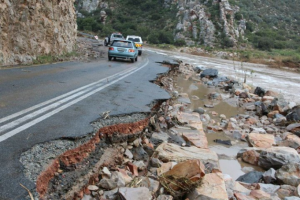 The Cogmanskloof pass through the Langeberg Mountains, near Montagu, is a major road that has flooded, cutting off the northern and southern parts of the Langeberg and causing logistical challenges, especially for response units such as emergency services, disaster management, police, and traffic services during a disaster. • Increasing sediment accumulation (aggradation) in rivers, also linked to increased alien vegetation (e.g., reeds) in riparian zones. There is limited weather radar coverage in the Western Cape, not only because there are not enough instruments in place collecting the data, but the mountainous topography means that accurate inland flash-flood forecasting is blocked by the Langeberg mountain range, As shown in the Figure below, this leaves very little of the Western Cape covered by accurate weather radar, which severely restrains accurate forecasting and warning in the province. 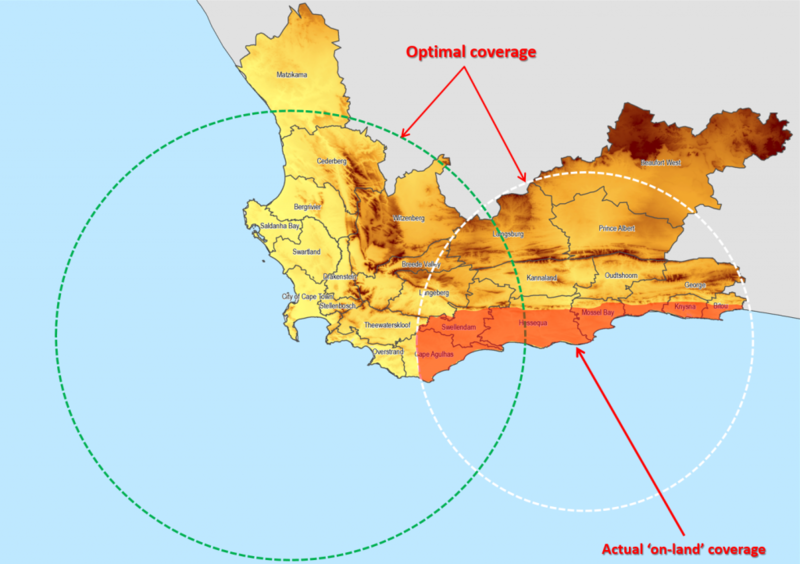 The implications were clearly highlighted during the 2011 and 2012 events, when weather warnings disseminated by the South African Weather Service did not specify areas such as the Langeberg Municipality. Heavy rainfall and flooding events in the Langeberg’s towns, such as Ashton, Montagu, and Robertson, claimed several lives, including that of an ambulance attendant. 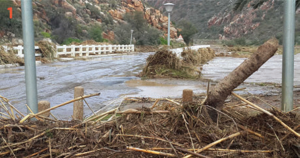 In both instances, preparedness mechanisms that should have been activated were not triggered, as flash flood warnings were not issued for the Langeberg Municipality.